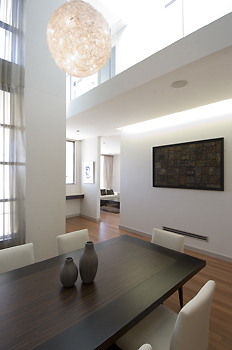 A new 3-storey residence, the White House was designed principally on the Japanese principle of Ma. This theory evokes ideas of elements nearly touching each other with the space in-between used as cavities allowing light to filter to the lower levels of the house. The house has a strong angular design of minimal aesthetic, with highlights of poetic curves in unexpected places that work together coherently. A highly green house due its passive solar design, there is little need for any air-conditioning in this contemporary house. Highly stylised and unique front. 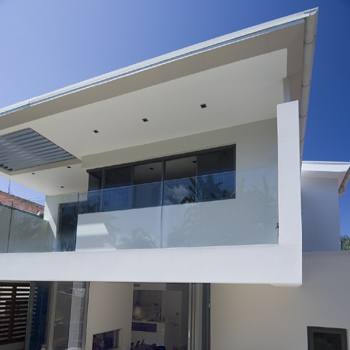 Two strong roof angles, blade walls and a soft curve dominate the front providing street presence. 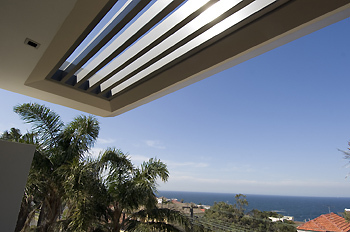 The sinuous curved balcony salutes the ocean while fixed louvres above filter light to the balconies below, providing a hint of what is to come once inside. 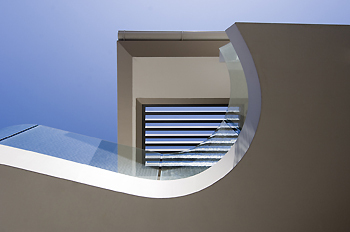 Looking straight up at the curved balcony with the strong roof form beyond provides a harmonious counterpoint. The strong geometry of the house follows all the way to the rear with blade walls, filtered light and a large overhang. This provides wonderful shade in the afternoons while allowing excellent visual surveillance over the backyard. The fixed louvres are cantilevered over the balconies providing the feel of a floating roof and here colour is used to accentuate the filtering effect. 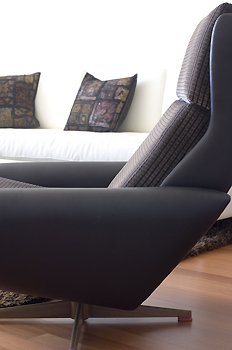 Craftsmanship meets design. 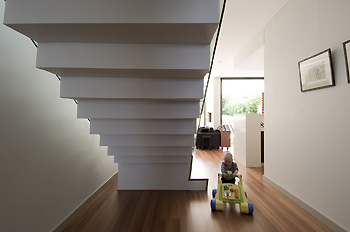 The stair is stepped underneath to provide continued interest and a sense of fun and play to the geometry. The stairs are withdrawn from the immediate supports of the adjoining wall to allow light to filter to the ground floor and allows the stairs to be considered as sculpture. 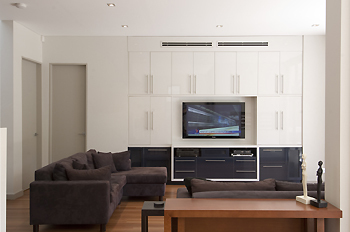 Lots of storage space is placed in cupboards in colours that blend in with the adjoining walls. The television is placed and recessed into this cavity. Speakers are all concealed in the joinery and ceilings. 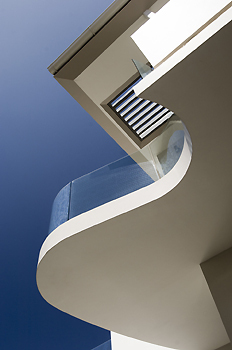 The curved balcony is replicated with curved frameless glass, again with filtered light from above. The cantilevered rear section of the house provides abundant shading while the strong geometry floats over the glass below. 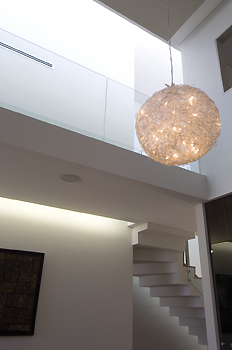 The bridge and stairs work together allowing light to the level below in the double height void overlooking the dining room. A great presence is given to this space with furniture designed by us below the bridge and next to double height elements. 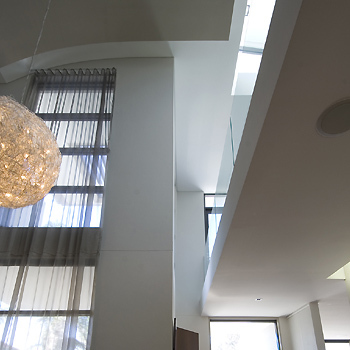 The large void allows unique features such as double height windows, curtains and a curved ceiling adjoining the bridge. 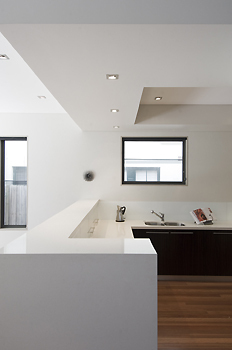 Polished stone benchtops and countertops mimick the ceilings while still allowing visual access into minimalist kitchen. The original chair was designed and built in the 1950's and has been restored by us with new materials to its former glory. 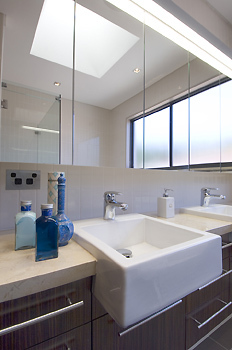 The master ensuite is showered with an abundance of light from the skylights in the recessed bulkhead above. Site features: land rises sharply from street. Expansive views of ocean to east. 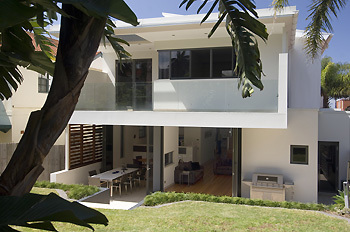 Architecture highlights: Light filled interiors with large clerestory windows, bridge to master bedroom. Incorporating large home office seamlessly integrated with the house.